For those with wedding in mind we present the world’s best known palace in India, "Hotel Aashirwad" This architectural masterpieces are the epitome of a legendary past, showcasing the opulence, valor and courage of the great Rajput rulers. 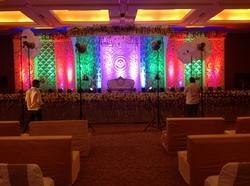 Our roof top Marriage Hall can accommodate 550 to 600 persons for your family wedding. The hall has suitable are to cater to meals as well as for appropriate seating of newly wedded bride, groom and their guests. The hall is also suitable for holding private lunch or dinner functions, birthday parties & child's rice ceremonies. A perfect blend of modern comforts with a rich, rustic ambience, We offer an imaginative and sophisticated venue for events or weddings, that host about 300 guests. We also provide catering services. We, Bhardwaj Holidays are Offering Hotels & Banquet Halls for Wedding/Marriage Party, Birthday Party or similar related parties, so if you are also looking for Hotels or Banquet Halls Booking anywhere In India then please contact us to know more details of our Services.